หนูตามบุญ คำตอบคนชื่อองค์ดำตอบ ถูกต้องและชัดเจนที่สุดแล้วนะ ตุ๊ลุงไม่ขอตอบอีกแล้วนะจ๊ะ *Tarmboon, You may take the opportunity to observe the five precepts as a means of developing higher virtues and self-control. Also self-reliance and responsibility are important features of the practice of Buddhist morality. นมัสการพระอาจารย์ค่ะ ขอบพระคุณสำหรับคำแนะนำซึ่งจะเป็นแนวทางในการปฏิบัติที่ถูกต้องต่อไป To the old monk, Thank you very much , I will be make and control myself to observe the five precepts,everything I do, I do for myself on the next and now. Thank you very much again for your moral success. Your English is very excellent level! To the old monk, I am just a little girl and very little knowledge .But when I found the teachings of the Buddha,I thought I knew the liberation of suffering. Every people have unjust deed of them-self, especially I am . So I must be learning and hardly practice with effort and patience,I need to release, to peace of mind and Nirvana. Thank you very much for your kindness suggestion, it is very helpful for me and others. I wii try to do. Sathoo, Sathoo, Sathoo, Arnumotana Mi. To...D.S. kid! You are from D.S school arent you? Are you a senior high school? What is your level in English? What the most difficult part about learning English? Even if you study English at a language school it doesnt mean you cant learn outside of class.Using as many different sources, methods and tools as possible, will allow you to learn faster.There are many different ways you can improve your English, so dont limit yourself to only one or two. The biggest problem most students face in learning English is their own fear. Please remember it is necessary to learn English if you are planning to study at a foreign university or school. To M.5 student..... I have been learning English since I started to go going to primary school. I learned English by myself and rarely went to English class as well. I enjoy learning through interaction with people who are good at English. I also love to participate in the English language community, reply to the discussions and sometimes I start a discussion too. Anyway,one of the best ways in regard to how to learn English well is to speak. Speak as much as you can in English, even though you may be uncomfortable at first. Please remember that everyone will understand that you are learning to speak English and are likely to be shy when you try it at first. This is not a problem. If you don't start, you will never learn, so give it a try, even though the first time might be hard, the next will be easier, and the next even easier, and so on. The more you speak English, the better you'll become, so don't be afraid. Speak out, and pretty soon, you'll be speaking English easily and will wonder what you were ever worried about. ** I will give my E-mail adress to you next time, Bye for now. Thanks again Tulung, What a good hearted monk you are! I would like to discuss about english subject with you, It will make me have a good knowledge about english, Please tell me more how to learn english, Would you mind telling me your real name? You live in Wat Phrakeaw don't you? How old are you kha? Are you an english teacher? Have you ever come to visit my school before? Thanks in advanced Kha Tulung. I hope you can answer my questions. 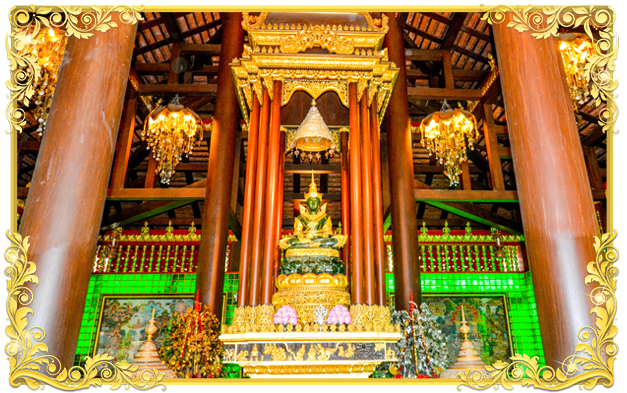 I am looking forward to welcoming you to the magnificent temple of Chiang Rai (Wat Phrakaew) where you will be sure to make friends and improve your English. Dear The old monk/Tulung Why can't I ask you about your personal stories? Because of I would like to know you and want to know an english teacher as you are, I'm sorry asking you those questions, I have to tell you that I'm very happy to know you.My Mom always makes merit at Wat Phrakaew and I had told her that I have known a kind-hearted buddhist monk over there named The old monk or Tulung, She's very proud of me, because she wants me good at english and it makes me improve my english as well, I hope to see you one day so that I may know you better. Hoping to read your messages once again. See you kha. Hi, The old monk, - Why English is a very important language in the world? - Why English is very important for students? - What is the biggest problem students around the world have when trying to learn to speak English? - What are your favourite methods to learn English? I must call English that the language of communication. Why? Because it seems all the people in the world have agreed to use English to talk to each other. Also English is the language of technology, especially high technology like computer science, genetics, and medicine. If you're going to read about technology, you'll probably have to do it in English. Please remember that English is not only the most useful language in the world. It is also one of the easiest languages to learn and to use. Learning to speak English well may be the best thing you can do to improve your life. Because English is the one of the most widely spoken languages in the world. English is important because it is our international Language. It is used in many countries. English is a common language to students. Teachers should motivate students for participative learning. This will solve all the stumbling blocks in students. Teaching learning is not a one-way process. It is a multi-way process. As soon as the teaching is over, students should raise their doubts, clarification, etc. Whenever possible, students should listen to native English speakers engaging in conversation or teaching concepts. This practice sharpens students' ears to unique rhythms and pronunciation of English and can provide insight into more abstract and advanced English, such as phrasal verbs and slang. Oh, My god... You Pen Dek Dee Mark Mark, Ma Jark Samakkhi Rue Damrong Kha? Tam Mai Keng Mark Mark..
i am student in m.1 of Phanpit A. Phan. i want to apply to be your student. are you ok? I like reading this theme, It is very useful for students who love learning English. Please post more English themes(topics) so that all students can educate and study about English. The topic is worth discussing. พานพิทยาคม กับพานพิเศษพิทยา ร.ร.เดียวกัยป่าว เห็นว่า น.ร.เก่งสอบเข้า ส.ว.ค. และ ด.ส. ได้เยอะแต่ละปี แต่เราอยู่ ด.ส.